Document view allows you to build multiple reports and charts on the same canvas. The styling, design, and report building functionality of Live Preview and Query Design view is available in Document view. In addition, there are many other features that simplify building documents. You can build and insert multiple reports in the form of reports and charts into documents. You can also insert images and text for presentation and organizational purposes. With InfoAssist opened in Document view, you can insert multiple charts and reports onto the canvas. These reports can be from different data sources. With documents, you have the option to add additional data sources to the document. In order to insert reports from different data sources, the document must have multiple data sources loaded. For more information on adding and switching between data sources, see Data Tab. Note: You cannot use multiple data sources when working with a Reporting Object. A document can display multiple reports from multiple data sources in the same document. With InfoAssist open in Document view, insert a chart or report. If your document has only one data source, insert additional data sources. For more detailed instructions on inserting multiple data sources, see Data Tab. Switch to a data source different than the one used in step 1. For more detailed instructions on switching to a different data source, see Data Tab. Insert a chart or report using this new data source, following the instructions given in Inserting a New Report. Your document is now populated with reports that have data from different data sources. You can add as many data sources as you need. With InfoAssist opened in Document view, you can insert multiple charts and reports onto the canvas. The procedures in the following sections detail how to insert reports into documents. In Document view, you can insert a report in the following ways. Double-click a data source field. Right-click a data source field. Drag a data source field onto the canvas. When you use the Insert tab, double-click a data source field, or right-click a data source field, a report placeholder is inserted in the upper-left corner of the canvas. When you insert an existing report, which has already been created and is referenced via -INCLUDE syntax, and then select it on the Document canvas, the data fields do not display in the Query pane. Dragging a data source field onto the canvas inserts the place holder at the location you dropped it. The following procedures describe how to insert new reports. For more information on how to edit existing reports, see How to Style and Customize a Report. The Insert tab is only available to insert reports in Document view. For more information on the Insert tab, see Insert Tab. With InfoAssist open in Document view, click the Insert tab. In the Reports group, click Report. A report placeholder appears in the upper-left corner of the canvas. You can now add fields to the report using the canvas and the Resources panel. For more information on how to use the Resources panel to add additional fields to the report, see Understanding the Resources Panel. You can insert a report by dragging data source fields from the Resources panel onto the canvas in Document view. To insert a report, make sure that Report is selected on the Format tab, in the Destination group. This option is also on the Home tab, in the Format group. With InfoAssist open in Document view, click the Format tab. In the Destination group, click Report. Note: You can also click Report from the Home tab, in the Format group. Select a data source field from the Data pane in the Resources panel and drag it onto the canvas. Make sure that you drop the data source field onto an open area of the canvas and not on top of another chart or report. A report with the selected data source appears in the Results panel, as shown in the following image. You can double-click a data source field in the Resources panel in Document view. To insert a report, make sure that no report is actively selected on the canvas and Report is selected on the Format tab, in the Destination group. This option is also on the Home tab, in the Format group. Note: You cannot insert a new report by a double-click if a report is actively selected. If a report is selected, click the canvas to deselect the report and make the canvas the active object. Note: You can also click Report on the Home tab, in the Format group. Double-click a data source field in the Data pane of the Resources panel. You can insert reports by right-clicking a data source field in the Resources panel in Document view. To insert a report, make sure that no report is actively selected on the canvas and Report is selected on the Format tab, in the Destination group. This option is also on the Home tab, in the Format group. Note: You cannot insert a new report by a right-click if a report is actively selected. If a report is selected, click the canvas to deselect the report and make the canvas the active object. Note: You can also click Chart on the Home tab, in the Format group. Right-click a data source field in the Data pane. A report with the selected data source appears in the Results panel. With InfoAssist opened in Document view, you can bring multiple charts and reports onto the canvas. The procedures in the following sections describe how to insert charts into documents. Drag a data source field from the Resources panel onto the canvas. Note: When you use the Insert tab, double-click a data source field, or right-click a data source field, a chart placeholder is inserted in the upper-left visible portion of the canvas. The following procedures describe how to insert new charts. For more information on how to edit existing charts, see How to Style and Customize a Chart. The Insert tab is only available to insert charts in Document view. For more information on the Insert tab, see Insert Tab. In the Reports group, click Chart. A chart placeholder appears in the upper-left corner of the canvas. You can now add fields to the chart using the canvas and the Resources panel. For more information on how to use the Resources panel to add additional fields to the report, see Understanding the Resources Panel. You can insert a chart by dragging data source fields from the Resources panel and dropping them onto the canvas in Document view. To insert a chart, make sure that Chart is selected on the Format tab, in the Destination group. This option is also on the Home tab, in the Format group. In the Destination group, click Chart. A chart placeholder with the selected data source appears in the Results panel, as shown in the following image. You can now add fields to the chart using the canvas and the Resources panel. For more information on how to use the Resources panel to add additional fields to the report, see Understanding the Resources Panel. You can double-click a data source field in the Resources panel in Document view. To insert a chart, make sure that no report is actively selected on the canvas and Chart is selected on the Format tab, in the Destination. This option is also on the Home tab, in the Format group. Note: You cannot insert a new chart by a double-click if a report is actively selected. If a report is selected, click the canvas to deselect the report and make the canvas the active object. You can insert charts by right-clicking a data source field in the Resources panel in Document view. To insert a chart, make sure no report is actively selected on the canvas and Chart is selected on the Format tab, in the Destination group. This option is also on the Home tab, in the Format group. Note: You cannot insert a new chart by a right-click if a report is actively selected. If a report is selected, click the canvas to deselect the report and make the canvas the active object. Include as Category Axis. For dimension fields. Include as Legend Series. For dimension fields. Filter. For all types of fields. Coordinated. The Coordinated field container contains a common sort field for creating multiple reports and charts that are burst into separate page layouts. Each value for a coordinated sort field appears on a separate page. A chart placeholder, with the selected data source, appears in the Results panel. The chart placeholder turns into a live preview of the chart once the X-axis and Y-axis data fields are selected. With InfoAssist opened in Document view, you can insert existing charts and reports onto the canvas from the Insert tab. The following procedure describes how you can insert reports into new documents and documents that are already populated with reports, text, and images. Note: When working in Document view, you cannot insert an existing report that has a HOLD. You can create a document in the Custom Reports section of the domain and use Standard Reports items as Existing Report components. You cannot use other Custom Report items as components. In the Reports group, click Existing Report. Browse to the report that you want to insert and click OK. The report appears in the upper-left corner of the canvas. Hovering the mouse over an existing report displays the report title as a tooltip. Note: You cannot edit an existing report that is inserted into a document. You can take a single report created in Live Preview or Query Design view and convert it into a document, displaying it in Document view. When you convert a single report into a document, the original report is preserved and a copy of that report is opened as a document in Document view. You can then add additional reports, charts, images, and text. With InfoAssist opened in Document view, you can bring text and images onto the canvas. The following procedures describe how you can insert text and images into new documents and documents that are already populated with reports, text, and images. Note: You can only do this in Document view. The following procedures detail how to insert text and images. For more information on how to edit existing text and images, see Editing Components in a Document. In the Objects group, click Text Box. A text component appears in the upper-left corner of the canvas with default text, as shown in the following image. Double-click, or right-click, the text component to edit the text. For more information on editing and styling the text, see How to Edit Text. In the Objects group, click Image. Browse to the desired image and click OK. The selected image appears in the upper-left corner of the canvas. The reports, controls, and text in a document can be edited, moved, resized, and deleted. Each of these components has a context menu which can be accessed by right-clicking the component. Images can be moved, resized, and deleted, but they have no context menu and cannot be edited. Right-clicking a image brings up the option to delete it. Using the component sizing handles. Changing the height and width on the Layout tab, in the Size & Arrange group. Accessing the options on the Size tab in the Size and Position dialog box. The resize feature is available for all components that can be added to a document. Open or create a document with at least one report, text component, control, or image. Sizing Handles: Select the component and drag the sizing handles that appear around it, as shown in the following image. As you manually increase the height and width of the component, the new values appear in the corresponding text boxes in the Size & Arrange group of the Layout tab. Select the component in the document. On the Layout tab, in the Size & Arrange group, enter values in the Height and Width fields. On the Layout tab, in the Size & Arrange group, click the dialog box launcher on the lower-left side of the group, to open the Size and Position dialog box. Right-Click Menu: Right-click the component and select Size and Position. The Size and Position dialog box opens. From the Size and Position dialog box, open the Size tab, as shown in the following image. 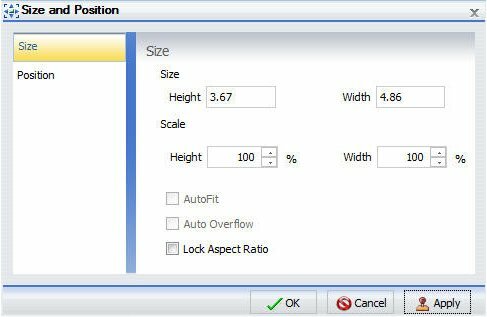 Use the Height and Width options to change the position of the selected component. You can adjust the pixel size of the object with the Size options or the scale percentage of the object with the Scale options. You can lock the aspect ratio using the Aspect Ratio button, which is available when working with charts, images, and text boxes while working in Document view. With the aspect ratio locked, changing the width automatically changes the height to keep the component to scale, and changing the height automatically changes the width. Note: The Auto Overflow option is only available while working with reports in Document view through the Size & Arrange group. With Auto Overflow set, you cannot manually set the height and width of a report. The area of the report expands automatically to show all data. The AutoFit option is only available for charts through the Size & Arrange group. With AutoFit set, the chart size becomes dynamic. This means that other applications can override the size of the chart when the chart is embedded. When two objects are selected, the Relative Position button sets the bottom-left corner of the component that is higher on the page to the upper-left corner of the one that is lower. Once a relationship is created, arrows appear to show that relationship while both items are still selected. You can move a component by clicking it, or by accessing the Position section of the Size and Position dialog box. This feature is available for all components that can be added to a document. You can also align components with each other so that their horizontal or vertical position matches. For more information, see How to Align Components. Drag the component anywhere on the canvas. Right-click the component and click Size and Position. On the Size and Position dialog box, click the Position tab, as shown in the following image. 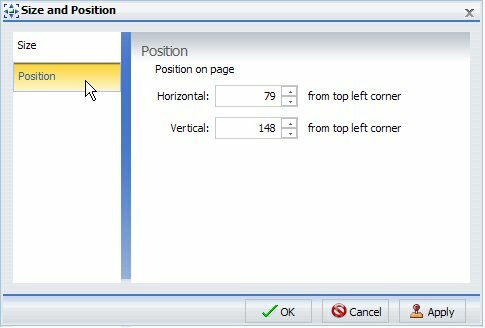 Use the Horizontal and Vertical options to change the position of the selected component. You can align components with each other so that their horizontal or vertical positions match. You must have multiple components selected to use the align options. The alignment is anchored by the component that is in the farthest position of the selected alignment. For example, if you select two components and click Align Left, the components align horizontally with the component farthest to the left. Open or create a document with at least two components. Select a second component by holding the Ctrl key and clicking a component. Note: You can select multiple components simultaneously by holding the Ctrl key and with the left mouse dragging a selection box around the components. When you release the mouse, sizing handles appear around each component that you selected. Sizing handles appear around the components, as shown in the following image. Right-click one of the selected components and select an alignment option from the Align drop-down menu, as shown in the following image. Access the alignment options from the Align drop-down menu. The menu is available on the Layout tab, in the Size & Arrange group, as shown in the following image. The selected components align, as shown in the following image. Click anywhere in the canvas to deselect the components. When you select a component, you can perform various functions on the component, such as moving and resizing it, as explained in How to Move a Component. After clicking a component, you can use the ribbon to affect all settings of the selected component, except for fields. You can double-click or right-click a component to select individual fields to edit through the context menu or Field tab. In addition to reports, you can style and customize charts and text. For more information on charts, see How to Style and Customize a Chart. For more information on text, see How to Edit Text. Note: Images cannot be edited. Open or create a document with at least one report. The Query pane becomes active and you can now select fields within the report. Select a field by clicking it in the canvas or in the Query pane, as shown in the following image. For more information on styling and customizing reports, see Creating and Customizing Reports. In addition to charts, you can style and customize reports and text. For more information on reports, see How to Style and Customize a Report. For more information on text, see How to Edit Text. Open or create a document with at least one chart. The Query pane becomes active and you can now select fields within the chart. Select a field by clicking it in the canvas or in the Query pane, as shown in the following image. You can now edit the selected chart using commands available through the context menu or the ribbon. For more information on styling and customizing charts, see Creating and Customizing Charts. In addition to editing text, you can style and customize reports and charts. For more information on reports, see How to Style and Customize a Report. For more information on charts, see How to Style and Customize a Chart. Open or create a document with at least one text component. Sizing handles appear around the border and the text box toolbar becomes active, as shown in the following image. Click anywhere in the text box and begin entering text. Highlight the text you would like to edit, and right-click it. A menu of options appears, as shown in the following image. Using the menu options, you can style the text and insert quick text. Font. Opens a list of available fonts for the selected text. Size. Opens a list of available text sizes for the selected text. Bold. Formats the selected text in bold. Italic. Formats the selected text in italics. Text color. Opens the Color dialog box where you can select a color for the selected text. Cut. Cuts the selected text. Copy. Copies the selected text to the clipboard. Paste. Pastes the selected text from the clipboard. Date. Opens a list of date quick text in various formats. Time. Opens a list of time quick text in various formats. page #. Opens a list of page number quick text in various formats. The following procedure applies to all components in Document view. Open or create a document with at least one component. Right-click the component and click Delete. The component is deleted from the canvas. Note: You can also delete a component by clicking it and pressing the Delete key.